Have you checked out this book, The Half-Square Triangle by Jeni Baker? I love making half-square triangles so I was eager to get this book. 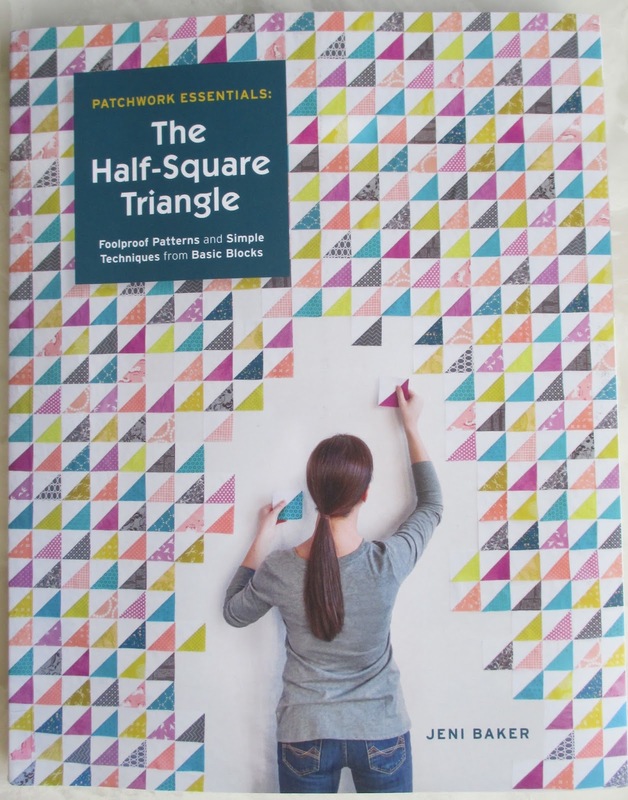 And even though I've made several half-square triangle blocks and quilts, this book has several patterns, blocks and techniques that make it a worthwhile addition to my library. There are twelve different large quilt patterns, and when I say different patterns, I mean different from each other, different from the norm, with different options. This pattern is called Triplicate, it's one of my favorites. I think it would also look great with a scrappy background or maybe a linen! The book also provides 60 different 16 HST block patterns (4 hsts x 4 hsts) so you can create your own sampler quilt. 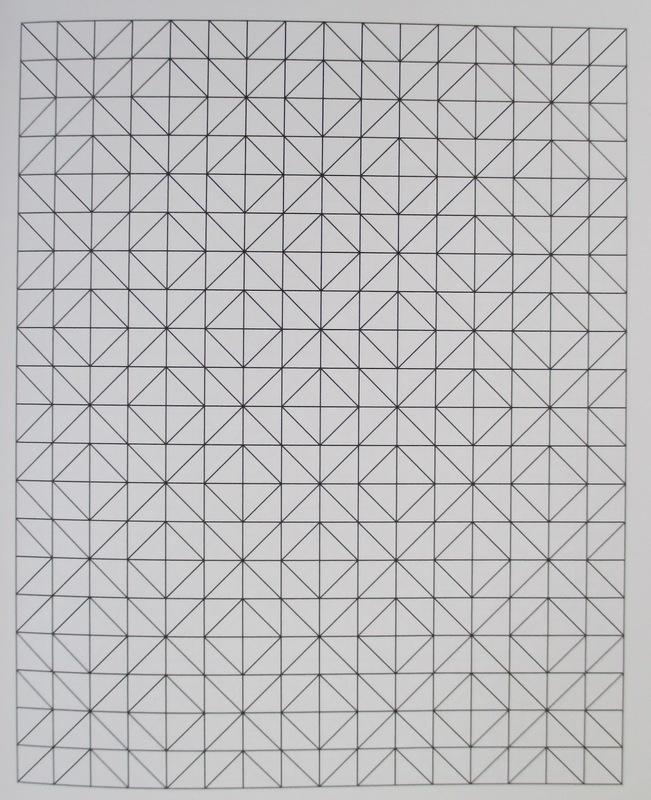 My favorite feature of the book is the colorless templates provided for each pattern. I plan to get out my colored pens and create my own design using these templates as a starting point. 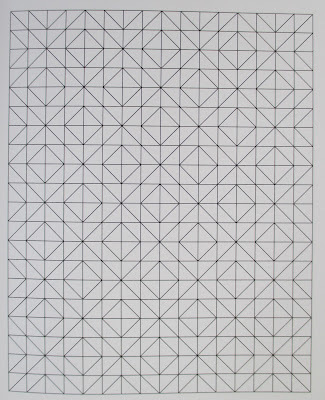 I sometimes draw patterns on graph paper with a pencil, I can skip that step and use these templates instead. I wasn't asked to review this book, I bought it, I like it, and I thought I would pass the information along to you. It's probably available at your local quilt shop, if you're like me, and don't have a local quilt shop, it's available from Amazon, here. Something else available from Amazon is the 2016 AQS Wall Calendar. Does that cover quilt look familiar to you? It's my Coastal Lily top quilted by Judi Madsen. 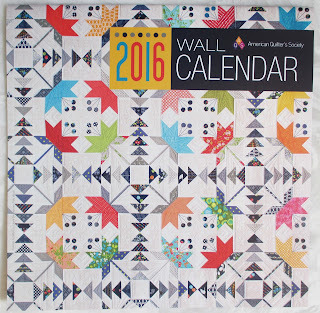 I'm very honored the quilt is featured on the cover of the calendar. Each month features a different winning quilt from the 2015 AQS Paducah Quilt show. The photography and colors are amazing, as are each quilt. If you would like to order this calendar check it out here. Because it's Wednesday, and because I'm so happy my remodeling days are a thing of the past, and because it's been ages since I've had a giveaway, I'm giving away the Jeni Baker book and the AQS Calendar. If Amazon will deliver to your address you're eligible to enter, just leave a comment telling me what you've been up to this year, at home, in your sewing room, or travel, whatever suits you, it seems like ages since we've chatted!! Giveaway now closed, thanks for stopping by! Oh I love your quilt, and I'm so happy for you that it made the cover of the calendar. Gorgeous! Wish I could say I've done some amazing things this summer but I haven't. Lots of gardening and canning in between taking care of mom and dad. One had open heart surgery and the other is still in the process of chemo. Not a fun summer but believe it or not I do believe it could have been worse. Thanks for the chance to win some great prizes. How exciting to have your quilt on the cover! I loved seeing your quilt at Paducah. One of my goals this year was to get some UFO's finished and that has been happening, plus making a new quilt for my grandson. I am currently working on a Christmas quilt. One of the highlights this year was taking the Rick Steve's 17 day Italy tour .... what a great trip! Normally DH and I just travel on our own in Europe, but do highly recommend his tours ... so well organized and well planned! I have been doing more organizing than actual sewing, but I am making progress. Your cover quilt is gorgeous. Thelma, I'm so proud of you to be a cover girl!! It's been amazing watching your blog and your quilting talents grow. You've been doing a great job. I finished TWO Bonnie Hunter mystery quilts this year, so have tons of small HSTs in a basket in my sewing room. I also spent two wonderful weeks in France this summer. The first week was with the team from French General at their Chateau Getaway. What an amazing group and an amazing week. If you've ever thought about going, go! My husband met me in Paris and we spent a lovely week exploring the city and celebrating our 26th anniversary. The whole trip was incredible. Your Coastal Lily is awesome - such a beautiful cover for the calendar! My stitching has been few and far between so far in 2015. Sometimes life gets in the way. Yet my life issues are getting sorted and I'm hoping for a fun year stitching in 2016. I love half square triangles. It's been a crazy year for me also with the big move. I'm thrilled to be settled and enjoying life and my new sewing space. Planning lots of new projects and, like you, I'm a big fan of a good half square triangle. Glad things are back to norm for you! Your quilt is a cover girl, how wonderful is that! Congratulations! This is the first I've heard of Jeni's book. Thanks for the heads up. As for projects, I just finished the 7th doll quilt for a guild challenge. We buy dolls or stuffed animals, outfit them with a quilt, and then donate them to a local non-profit organization that helps families in transition. Very gratifying sewing. I am so excited you have decided to blog more often. I have recently moved back into my family homeplace that had stood empty for 12 years so you can imagine the work I have to do here. No sewing all summer. Did get some canning and freezing done. Thanks for an opportunity to win. The book looks very interesting and the calendar would look great in my sewing room. I am spending the week with new quilt friends at an event called Boxwood and Berries in Spring Green Wisconsin. Great fun! I have been making an effort to finish up UFOs. I have a long way to go, but I have finished a lot of projects this year. I've stalled a bit over the last month since I sold my original long arm, but the new one gets delivered in Sunday. Woohoo! I'm trying to get my collection of tops quilted and out of the way while simultaneously adding to the stack. In other words, spinning my wheels, but having a grand time pursuing my hobbies of quilting,sketching and watercolor. I'd love to win your giveaway. Thanks so much! I have spent the past year in a temporary living situation. I never dreamed, when packing up our house in Iowa that a year later, I would still be waiting to move into our next home. The movers recommended only taking what we needed for 10 weeks. Boy, were we nieve, as we have had great difficulty finding a place to call home. Long story short, we are in the process of closing now, but it's not over til we are settled and I am getting re aquainting myself with my stash. I do have my machine & brought a few projects, just in case! Oh, & it's not all bad, I have picked up some new things to add to my stash, I do hope they play well together! I, like you, have been in the midst of a remodeling project. Although, mine doesn't sound as intense as yours. I've mostly been painting & painting & painting & painting some more. Every wall and ceiling will have been touched by me and my paintbrush. The best part was painting my new sewing room...all mine, just me and sewing! I no longer have to share with a washer & dryer, coat rack and totes full of seasonal decorations :) I LOVE your Coastal Lily quilt, definitely one of my all time top 10 quilts! Thanks for the opportunity to win great prizes. Finishing UFOs has been my goal this year. So far, I've completed 8. This year has been a change in season of life. My oldest graduated from college and moved away from home. Another child is almost done with college. I have been trying to find my purpose in this next season of life. Maybe starting a Coastal Lily quilt is just what I need. Oh my goodness Thelma -congratulations! The calendar looks wonderful. I made a list of 12 UFO's in January and have been VERY focused on chopping down on the list. i also have not been starting a lot of new projects which is basically killing me at the same time. I do feel rather smug about my 9 finishes on the list though.😀. I have done a lot of sewing but I am also getting ready for my daughters wedding--so lots of fun sewing projects for that! I haven't been up to very much...quilting OF COURSE and getting the yard and house ready for winter. The book and calendar look amazing! Thanks for the chance! I spent my summer at our lake house. Now, I need to finish quilts that have been languishing in my sewing room. I'm trying to use my stash and buy less. I love "Coastal Lily!" Hi Thelma, I recently retired from school nursing, so have been busy getting my sewing room better organized and quilting up a storm. I enjoy your blog and your quilts are lovely! Quite an inspiration to me. My year has been busy with rehab from a broken hip, and three trips to Nags Head, one just three weeks after the hip fracture, the next in June with our children and grandchildren, and the latest was just the week before last. That one was much quieter, just my husband and myself. Now I am finishing up some projects before I have surgery on my ankle soon. There is a long recuperation period, six months to a year, so I plan to be quilting as much as I can during that time. Congrats on your cover quilt__ quite the honor. I've tried to work on whittling down my stash, but I'm not making a lot of progress! Congrats on being a cover girl!! I made my first Lone Star Quilt at the wonderful Quilt Taffy Retreat in McCall, ID last month. I am now playing catch up on Cora's Gypsy Mystery Quilt and adding the sashings to my Sharon McConnell Blockbuster quilt. Besides that there are a few Renaissance Fair costumes for my son and cute granddaughter things for my first adorable granddaughter. Love Jeni Baker and her method of fabric folding is perfect! Thanks for this chance Thelma. Congratulations on having your beautiful quilt features on the calendar cover! I purchased a long-arm quilting machine at the beginning of the year - so needless to say, this year has been one of learning. Thanks for the chance to win a great book and calendar. It must feel just awesome to have your remodeling done! I can only hope for that when my husband retires in Feb. We've been piece mealing our remodeling since forever. Our area was hit quite hard with a tornado in June, so my daughter, who is also a quilter, came up with Pillowpalooza to make pillowcases for all the kids displaced. We've almost reached our goal and it's been fun and heartbreaking at the same time. Love your quilt on the calendar cover! Laura V.
Great giveaways! I have been working on Lucy Boston's Patchwork of the Crosses...time consuming as well as addicting. I've been busy making baby quilts and welcoming granddaughter #3 into our lives. I also took the time to cut my scraps into usable strips. Thank you for the chance to win. HELLO,THANK YOU FOR A LOVELY GIVEAWAY! This year has just flown by. We started the year with surgery on my husband's arm and followed with a lot of rehab. I made a few baby quilts for family. And now BAM the holidays are upon us! Yikes! This year had it's ups and downs like every one but the downs. The most 'down'-thing was that they found a tumor in my mum's breast (but thankfully they found it early) and she needed surgery and therapy. She's now finihsed with it and gladly all went okay. I hope she'll be cancer free for the rest of her (long) life. I've been busy making lots of quilting projects, made a couple of blouses, and am caregiver for my husband, who has m.s. Perfect quilt for the cover! I love it. I've been busy whipping up some Halloween quilts around here and putting out all my pumpkin decorations for the fall. New grandbabies have been keeping me busy sewing and knitting. I love it. The family is growing. I'm also trying hard to finish things instead of starting new projects. Loved your interview with Pat Sloan. Congrats on your quilt being on the cover of the calendar! Oops, forgot to say I've been busy sewing quilts for an upcoming craft fair! How exciting your quilting life has become - podcasts, calendar covers, who knows what's next? Your work is so amazing that the attention is well deserved. My blog has been neglected for 6 weeks now (gasp) while I attended to one family problem after another but I'm determined to begin anew. Feeling energized! I have two baby grandsons - one is 5 months old and the other is 10 months. Both live nearby but we have been very involved with the older one and he is with us at least one or two days a week including overnights. It's been exhausting and exhilarating and he has stolen our hearts. Our time is his right now. Thelma, it is so exciting to see your quilt on the calendar cover. I am happy for you. This year sounds as if it has been busy for me travel wise with a quilting cruise, a quilting bus trip and a weekend in New York City for Quilters Take Manhattan but I am ready to go again anytime! Quilting is the most social hobby of anything I have done. Love your quilt and that book looks awesome. Lots of house projects this year-now it's time to finish those UFOs. Congratulations for makng the cover (guess this means you are a covergirl!) Your quilt looks great there! I've been busy with two new twin grandbabies, and moving my daughter. Hope to resume sewing more soon. Not only published, but a cover. Good for you. I have been busy in my sewing room making quilts for the family and donation quilts for a local church. I almost bought that book yesterday and then decided I wouldn't (it was on line), now I know I should have. 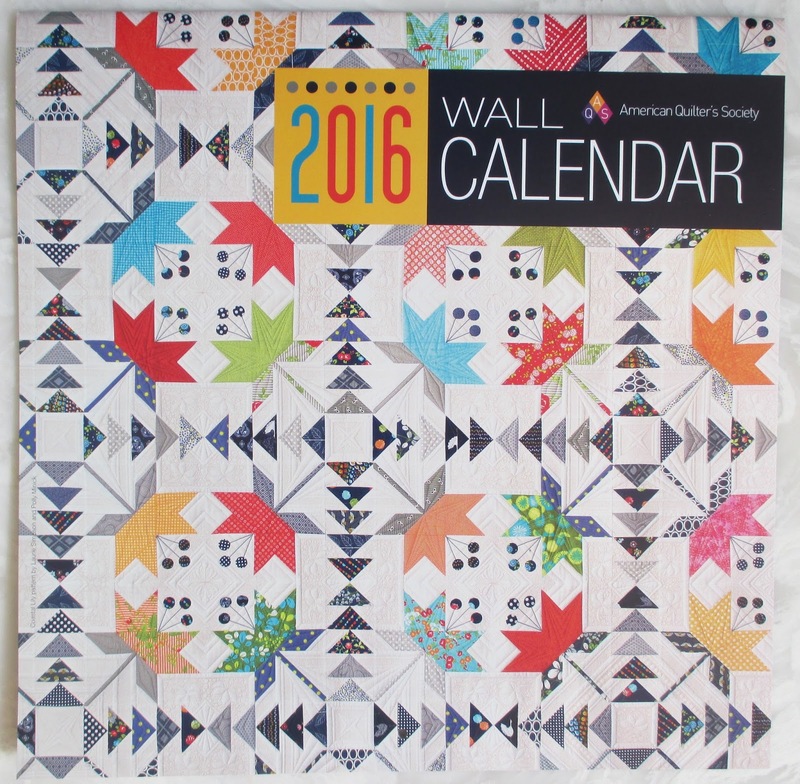 What a beautiful calendar...congratulations, the quilt is beautiful! Congrats on being a cover girl, Thelma! This has been a busy year for quiltmaking and travel. Life is good! How wonderful to have your quilt on the cover! I have been busy putting the last stitches in my City&Guilds projects, and have been exploring improv recently. I've been making surprise gifts too, such fun! That is fantastic that your quilt made the cover of the calendar. I've been away so long from blogs, but I've kept up on IG and it's really a great honor for you. This has been a busy year with ailing parents, some sewing and children going away to college (i.e., empty nest). I feel off my game this year. I love your Coastal Lilly quilt! I've spent the year finishing projects. I even found some that I forgot. My sewing room was painted and reorganized...when did I buy all this fabric. My grandbabies are on their way over to try on their Peter Pan ND Tinkerbelle costumes I just finished for them! So excited that your quilt is on the calendar cover! Great news! I'm trying to get one of my large Bonnie Hunter quilts finished before the new mystery starts. Coastal lily is a beautiful quilt. 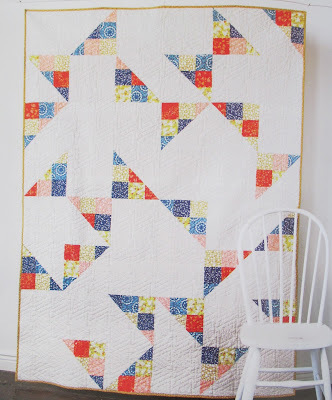 I look forward to your post on how you achieve accurate quilt blocks. I have been making scrappy quilt tops. I think soon I will start trying to learn how to free motion quilt some of them. Thanks for the giveaway. This year I was making step outs and writing classes to teach at AQS as well as preparing an exhibit of some of my quilts. I Love HSTS and love making quilts with them. I've been very busy caring for elderly relatives but I have managed to make a baby quilt for my first grandchild - expected November 4th. I can't wait! Thanks for the chance to win such a sweet gift! I've started working one day a week at my local quilt shop and started work on the 1930's Farmer's Wife quilt. Thanks for the giveway. Your quilt looks fabulous on the cover! I had a busy summer with my son and his family living with us for over a month while they waited for the house their new place to be remodeled. Lots of fun extra time with my granddaughters! I love the thought of 60 different sampler HST blocks. I made a wallhanging with 16 different blocks but would love to make a larger quilt with more blocks. My quilting slows way down during the summer so I am happily sewing like crazy now that it's fall. I'm like you in December, I like to work on seasonal things during the season so I've made pumpkin quilts and a maple leaf wallhanging. I'm just about to start a new quilt using Persimmon by Basic Grey. I enjoy your blog and seeing your beautiful quilts! You're a cover girl! Congratulations! I have made two quilts this year, one is a throw and the other is a king size. I just started "mocha trails" because I love your version so much. I'm using similar colors. I'm fairly new to quilting, so I'm getting good practice at trimming blocks to size and hopefully not chopping off the points. Your cover quilt is beautiful! I've been doing a lot of sewing, but not as much quilting as I would like! I'm quite fond of half square triangles myself - they are so versatile! I love your Coastal Lily and would love the calendar! Glad your remodeling is complete and you will be back to blogging. I find your blog very motivating! I'm working on Heartfire by Lynn Wilder in French General Fabric. Slow going buy I'll eventually finish it. I quit my job at a local quilting store to spend more time with my family and opened an Etsy shop with custom quilt labels. I was part of the QS committee at my guild and we put on a highly successful show. One of my quilts even won a 3rd place ribbon - I was shocked. I'm glad you're back posting. I hope I'm not the only one asking what couch/sofa did you get to replace that red sofa? It was a great piece in several photos. I've completed my first 2 mini quilt swaps and eventhough I enjoyed sewing for others, I'm not sure I will do it again. Now I have a list of WIPs that needs addressed. It's good to read you more often! Thanks for the giveaway! I have been sewing a lot-- I think I made about 20 quilts this year, including 12 for children in foster care. Trying to whittle down that stash (which is impossible because I keep buying more!). I have been working on several quilts, I just got back into quilting so I am diving into every project with lots of enthusiasm. I joined my first mini quilt swap, and my local modern quilt guild. Thanks Thelma for all your great content. I've been doing a lot of sewing lately, commission work, quilting, quilts of valor, etc. having a blast. Thanks for the great giveaway. That book looks awesome. Camille at focus20 dotcom. We've been working to get our home on the market as we're moving, so sadly I haven't had time for sewing. Almost there with the house, which will allow me time for sewing. Thanks for the giveaway. Glad to hear you are all done it's the remodeling and ready to sew! We replaced carpet a few years ago and haven't taken on any big projects since! This year I've been washing muddy cross country uniforms, driving my teenager around, and started doing some pattern testing. Glad your remodel is over! Love new, hate chaos! Thelma, I love reading your blog. 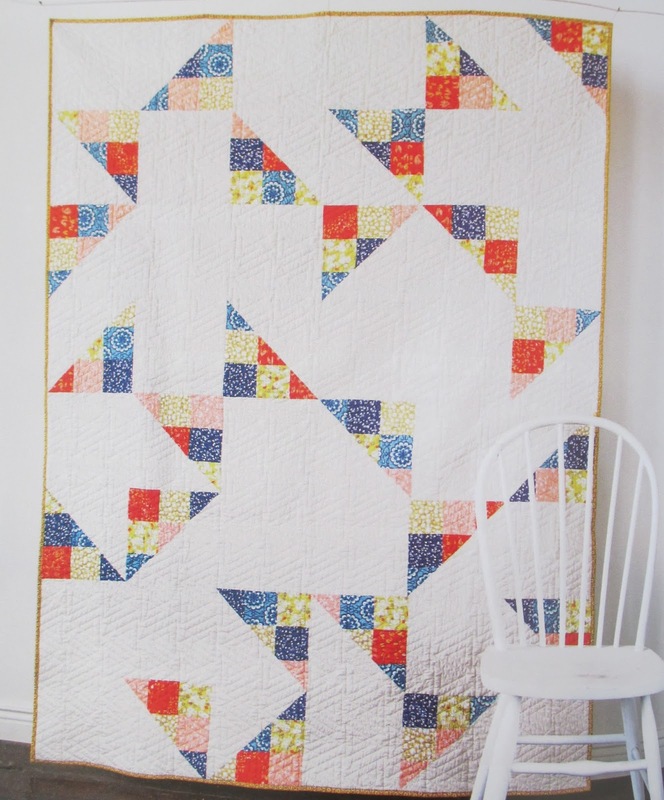 Jeni's book looks great and all your quilts turn out gorgeous. Congrats on the cover pic. Wow, this looks like a very interesting book. I don't love HST's but I don't hate them either. Your quilt looks so lovely on the cover of the Calendar! Well Deserved! Congrats to you ! I have been busy sewing frivols, and old projects that were tired of waiting to be completed. I have made a lot of progress. I sent my version of Lucy off to the Quilter so it should be back before Halloween! I can't wait,. I love this one. I love your blog Thelma and I love your quilts. It's wonderful your quilt is on the cover of the calendar. I am a new longarmer and have kept busy this summer practicing and quilting. I love half square triangles and they seem to be in all my quilts I make. I would love to win the book and the calendar. Thanks for the opportunity to win.